Bloom, bloom, bloom! 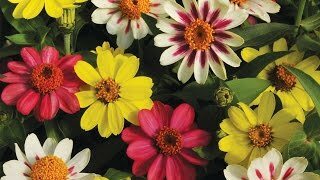 Glorious, high-performance super-bloomer unleashes a continuous cannonade of fabulous red blooms with variegated white-streaked foliage. Semi-trailing 20 inch plant—with blossoms held above handsome foliage—is on show all summer. In mild climates, sow seeds in early- to mid-spring; in colder climates, sow after threat of frost. Nasturtium, Troika Red is rated 3.8 out of 5 by 4. Rated 5 out of 5 by leojen from Very happy I love these flowers, so pretty and easy. I planted them in the corners of raised vegetable beds with great germination. They grew fast and became enormous, but they did die back in the deep heat end of july/early august, so heat tolerance might be an issue for higher zones.. I thought they were goners, but when the weather cooled they came back vigorously and carried on until frost. Some of the plants got pretty massive. The only maintenance they got was training and a trim when they overrun other plants in the veggie bed. The flowers are many and they are a lovely deep red, not orange, aren't bad for cutting, and the foliage is nicely variegated. They're similar to Alaska mix nasturtiums. I was able to save seed, so maybe next year I'll see them in the pollinator garden. Rated 4 out of 5 by Wesley_ from Changed my mind. I complained earlier about the lack of blooms. A few weeks later they did bloom and they are beautiful. The staff said that I may have them in to rich soil. Maybe you just need to start them earlier. Deep red flowers are wonderful. Rated 1 out of 5 by Wesley from Where are the flowers. Plants are about 12-16" tall. Twelve plants came up quickly. No buds or flowers. Eastern PA. Have had old fashion Nasturtiums for years. Try something new I said. What's the story?